CHICOPEE- Claudette Louise (Croteau) Kiely, 75, died at The Holyoke Healthcare Center, on May 1, 2012 after a lengthy illness. The daughter of the late Walter and Anna (Gionet) Croteau, she was born in Keene, NH on August 23, 1936. She lived in Granby, MA for over 40 years before moving to Chicopee 10 years ago. Claudette graduated from Keene High School in 1954, attended Becker Jr. College, and earned a Masters Degree in Education from the University of MA, Amherst in 1983. She was the Western Mass. Coordinator of the MA Chapter of the National Neurofibromatosis Foundation. She testified before The House of Rep. on behalf of the National Committee for Research in 1985. Claudette continued to lobby for many years to fund research, as this disease affected 4 of her children and about 100,000 other Americans. Prior to her retirement in 1993, she worked for the Holyoke Visiting Nurse Association as the Executive Director of External Affairs and was a member of Kiwanis Club. As a writer, author and poet, Claudette published 3 novels, many short-stories and articles. Her poem "Let Me Love You Through Eternity" is now a country western song, released by Gayla Earlene. She leaves her five children, John F. Kiely, Gerard F. Kiely and his wife Antoinette both of Chicopee, Jacinta M. Chase and her husband Stuart M. of Wolfeboro, NH, Donald J. Kiely and his wife Jean, and Lynn-Anne M. Kiely both of Chicopee; a brother Wayne K. Croteau and his wife Carol of Boise, Idaho. She was a grandmother "Jamma" to three, Colleen, Kelly and Jonathan. Her husband of 40 years, John B. "Jack" Kiely predeceased her in 1998; also, her brother Sidney W. Croteau, in 2010 and her sister-in-law, Margaret L. (Regan) Croteau in 1992, both of Branson, MO. The funeral will be held Tuesday morning at 8:30 a.m. from the Barry J. Farrell Funeral Home, 2049 Northampton St. followed by a Celebration of her life at 10:00 a.m. in Immaculate Heart of Mary Church in Granby. Burial will be at the convenience of the family. Calling hours will be held at the funeral home Monday evening from 4 to 7 p.m. In lieu of flowers, the family requests donations to Shriners Hospital for Children, 516 Carew St., Springfield, MA 01104 or Genesis House, 53 Mill St., Westfield, MA 01085.
x At the convenience of the family. 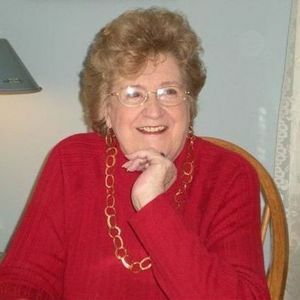 Burial for Claudette L. (Croteau) Kiely https://www.tributes.com/obituary/show/Claudette-L.-Croteau-Kiely-93742328#services https://www.tributes.com/obituary/get_ics/93742328?service=1969552&tr= At the convenience of the family. At the convenience of the family. The beautiful and interactive Eternal Tribute tells Claudette's life story the way it deserves to be told in words, pictures and video. Farewell my author friend. I will miss our conversations on good storytelling. And your good heart. I'm so sorry to hear of Claudette's passing. We spent many happy evenings in chat and visited on facebook. She was a vibrant, interesting woman. I pray for peace for those who were closest to her. What a wonderful lady....and so very kind. I send my sincere condolences to her family and friends. I only knew her on-line but admired her insight and ability to write her thoughts clearly and without offending various points of view. One day we will meet. Destiny (Claudette), you will be deeply missed. You've made a difference in so many live with your writing and blogs. Rest in Peace deal lady. A wonderful lady... so kind, so sharing, so loved. God has a beautiful new angel....... Soar to your highest Destiny. To the family of Claudette we send our heartfelt sympathy. Though we knew her more by her online name Destiny, she was always the sweetest, friendliest, lady. As you will see by the addresses posted here, Claudette had friends from all over the world that she has touched. God Bless you Claudette and Rest in Peace sweet friend. The loss of a mother is not the easiest step to take. For some this is the biggest loss of their entire life. However, having my mother in our lives has provided us with endless memories. Thank you all for your words of encouragement. I never met Claudette in person but have known her for several years. I first met her on Senior Friend Finder and later we exchanged E-Mail address. I will always cherish my memory of her. You have my deepest sympathy and will be in a lot of others prayers.